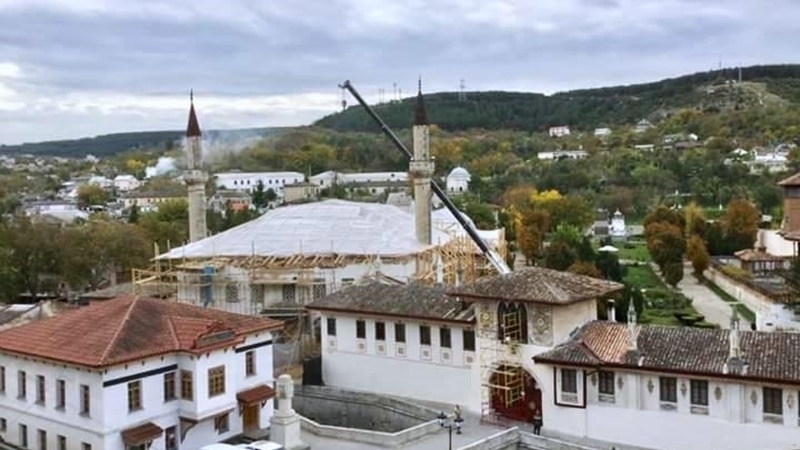 The situation with the Big Khan Mosque is becoming more and more catastrophic every day, ex-director of the Bakhchysarai Historical and Cultural Reserve Elmira Ablyalimova informed on her Facebook page. According to her, the north facade of the Mosque was cracked. “The load of collar band and rafters resulted in cracks. Apparently, that was the reason the stained glass windows cracked! I am sure that the administration of the reserve knows about this, as well as the contractors. That is why the facades of the mosque are thoroughly covered! We are waiting for a catastrophe - collapse of the facade!! !” She wrote. According to Ablyalimova, the walls of the mosque have been over 500 years old and they have not been destroyed by war or time, and now they are being destroyed by people and their absolute stupidity. "The people for whom Crimean Tatar history and culture have never been of any value!" She explained. The ex-director of the Bakhchysarai Historical and Cultural Reserve called on all those who are not indifferent to the history, culture, traditions of the Crimean Tatar people to express their attitude towards this barbarism on the page of the Bakhchysarai Museum-Reserve. "The Khan Palace needs our protection!" She summed up.